The new year has brought new beginnings and loads of blessings my way. I feel like imitating Willow Smith from her crazy 'Flip my hair' song all the time, jumping, screaming and doing what not! But I really don't heed to these silly urges of mine as I am quite aware that if I ever tried 'flipping my hair back and forth' then I would probably not be left with much hair. *gasps* You really need very strong, healthy and long hair for doing an act like that! 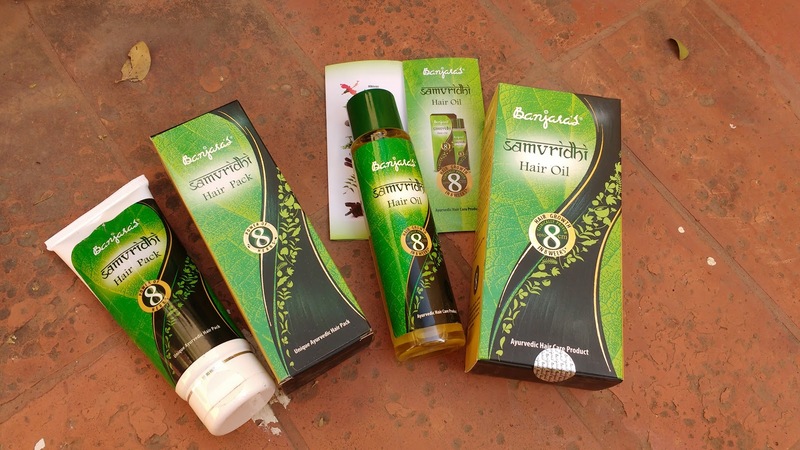 Banjara's is a brand famed for its natural Hair care and Skin care products. I have used their cream and their face pack before and I love their products as they are made from natural and herbal ingredients which give impressive results without having any side effects. 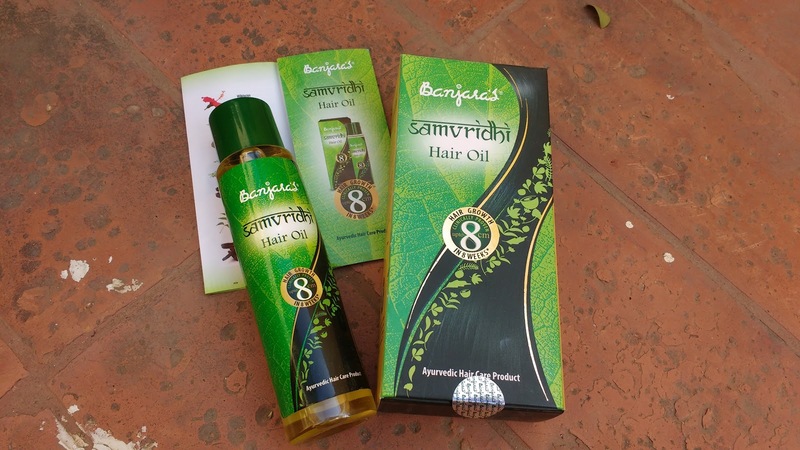 Apply Banjara’s Samvridhi Hair Oil to the hair and scalp. 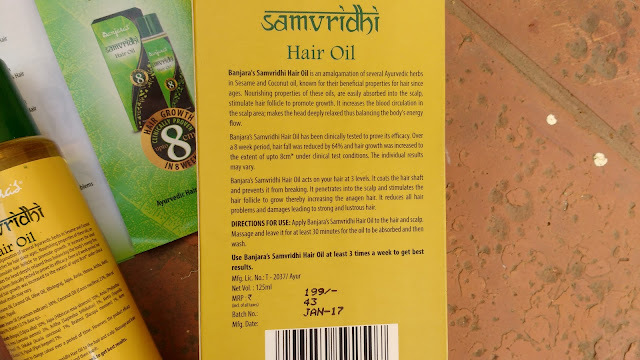 Massage and leave it for at least 30 minutes for the oil to be absorbed and then wash. Use ‘Banjara’s Samvridhi Hair Oil’ at least 3 times a week to get best results. 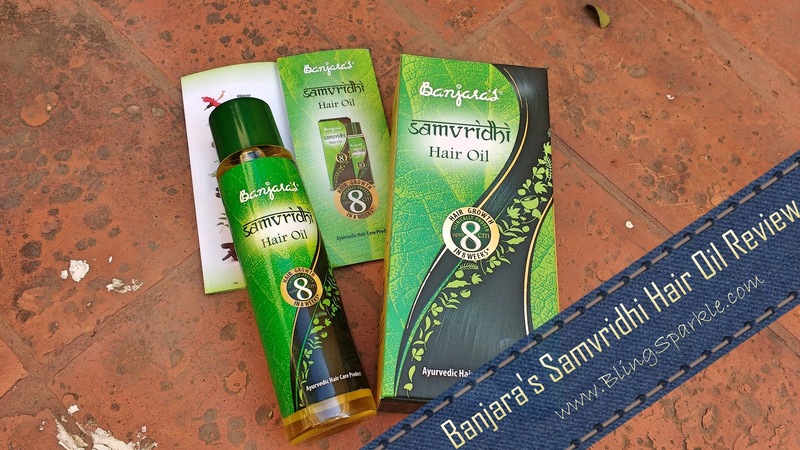 The Banjara’s Samvridhi Hair Oil comes in a transparent plastic cylindrical bottle with a sticker attached on it which has all the important details on it like the price, ingredients, how to use, etc. The cap is a green colour screw in one which is quite tight and firm. The bottle also has a stopper which ensures that there's zero spillage of the product. The product also comes with a pretty outer box and a pamphlet inside. My hair is very moody and it tends to lose its moisture very fast. This is the reason I make sure I oil my hair at least thrice a week. I was really excited to try out the Banjara’s Samvridhi Hair Oil as it had a very challenging claim of '8cms in 8 weeks'. 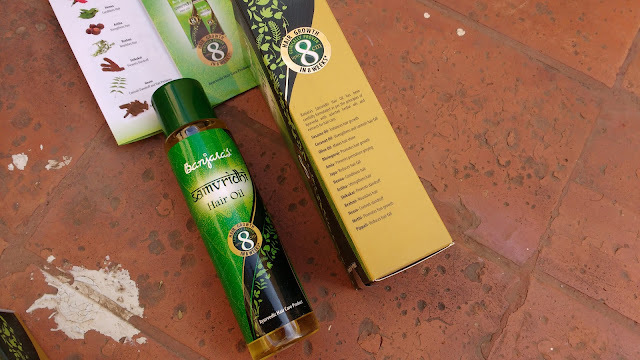 This oil is something like I have never tried before, it has a really calming effect which feels relaxing and rejuvenating as soon as I apply it. It has that cooling effect and stress relieving properties which I totally love. It helps me keep my stress issues in check and also nourishes my hair and restores their moisture. I was not very fond of the strong Herbal smell of this oil but it gives me really good results so I don't mind the scent any more. I also feel this is a very light weight oil which doesn't feel bulky when applied and it also gets washed off whenever I take a shower easily - I really love this as I usually use shampoos with low sulfates which do not lather much. I did not notice a major hair growth difference but I did feel that the oil has done wonders to my hair, it has made them frizz free, healthy and even more shiny! Banjara's Hair oil comes in a plastic cylindrical transparent bottle with a screw cap and addition stopper in which you need to make a hole. The screw cap is leak proof and the stopper controls amount of product dispensed nicely. 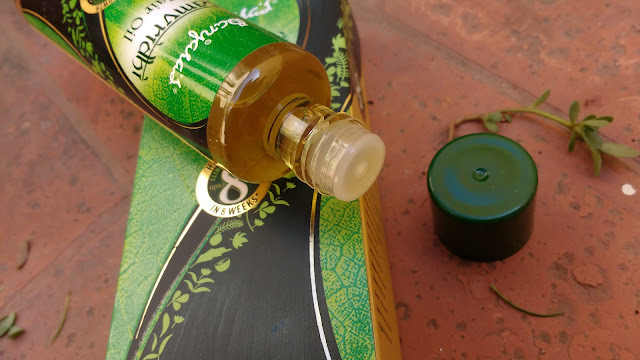 The transparent bottle helps me find out how much oil is still left and this bottle comes in a green cardboard box with a lot of details about product printed on it. Sleek, sturdy and travel friendly packaging. Massaging the oil into hair scalp and length is very relaxing and I love the calming effect it has on me. Sometimes I warm this oil a bit before applying and leave it overnight. I don't need to over shampoo my hair as Banjaras hair oil gets removed easily. After washing my hair feels soft, nourished and manageable. Texture of my hair has improved and they are a lot smoother and shiny now. Overall with repeated use my hair is smooth, less frizzy, strong and looks more healthy. Doesn't live up to the elaborate '8 cms in 8 weeks' hair growth claim. I also got to use the Banjara's Hair pack from their complete hair growth regimen and equally loved it! This was my first hair pack and boy was I floored by this amazing hair pack? hell yes ! Super soothing and leaves my hair shiny and voluminous! 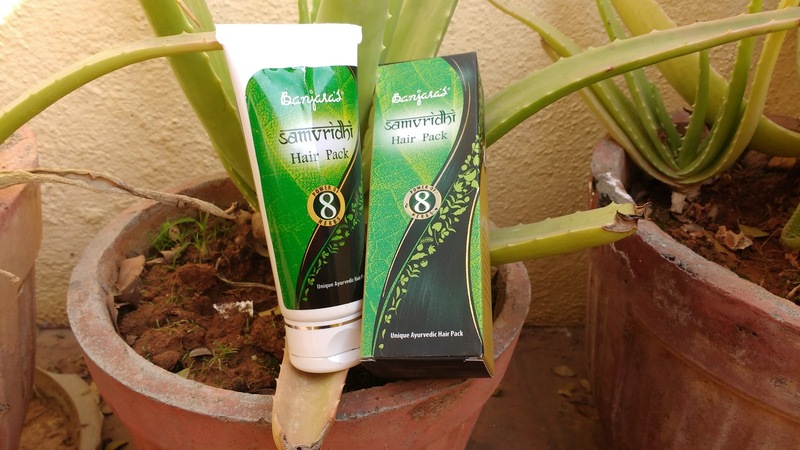 I prefer the hair pack with Banjara's hair oil on my scalp and the full length of hair. For best results, use both the Banjara's Samvridhi Hair Oil and the Banjara's Samvridhi Hair pack and give your hair the chance to rejuvenate. I am using the duo and I am loving all the herbal pampering which my hair is getting. Plus points for its enriched with goodness of henna, amla, brahmi , neem and methi. The best part is the application which surprisingly is so very easy as the creamy formula of this hair pack allows it settle easily on the scalp and roots of my hair. A lot of amount is used if you have long hair but you can still still use it for a good five to six times. Priced at INR 100 I wold say it is super affordable. Also its easy to wash away the hair pack and it does not dry and stick to my hair. The hair pack washes away even without having to shampoo my hair. It does not tug or cause my hair to break. Overall I absolutely loved the fabulous hair pack as it gave my hair a healthy lustre and left my hair naturally thick and bouncy. 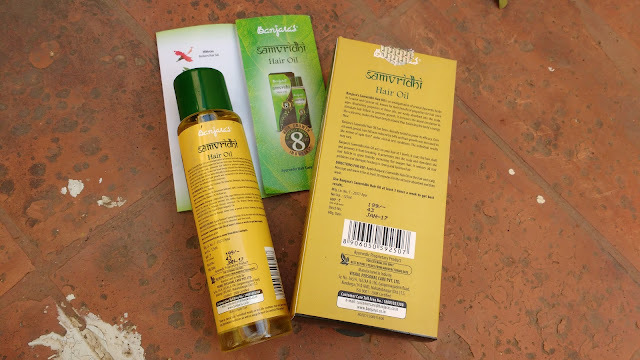 All in all, I would totally recommend the Banjara’s Samvridhi Hair Oil as its one of the best care you can give your hair. 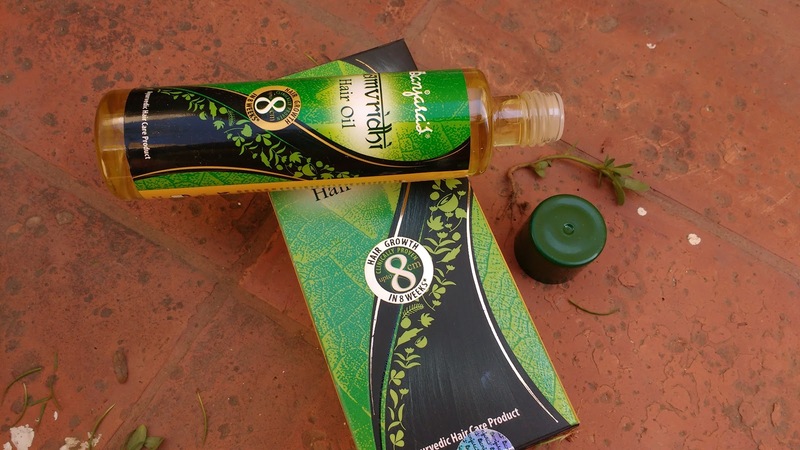 This hair oil is enriched with herbs and it nourishes, repairs and pampers my hair. It gives a very relaxing effect and protects my hair from the harms of pollution. If you too want long, strong and thick hair which are frizz free then you should definitely give the #BanjarasSamvridhiHairOil a try!